Starting today, all Stressless products are discounted for customers, with an extra portion being donated to charity. 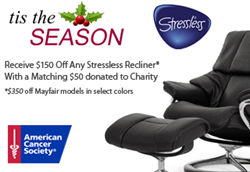 Savvy Home Store is giving back to its customers and the American Cancer Society this holiday season with a special discount on all Stressless brand products. Launching today, all Stressless products are discounted $200, with a $50 donation to charity, for a net discount of $150. There is no work required for the customer. Products are marked $150 off on the website, and the additional $50 will be donated to the American Cancer Society for each sale. "There are so many great charitable causes to partner with," said Savvy Home Store President Max Alcabes, "Our Savvy Home family has been particularly touched by the pain of cancer, and this year we wanted to share our success with the American Cancer Society." If a customer has another charity they would prefer to donate to, they can let Savvy Home Store know and a donation of $50 will be made to the charity of their choice. "2017 has been the best of our 27 years in business, all made possible by our wonderful customers and staff," said Savvy Home Store CFO Jacques Alcabes, "Giving back to the American Cancer Society with the donation and to our clients with our holiday discounts is a perfect way to end the year on a positive note for all."